PARADISE ON THE BEACH - ENJOY SAYULITA AT ITS BEST! Playa Los Amigos in Sayulita is a charming oceanview home just steps from the beach in the Las Gemelas complex. The enclosed compound is located on the desirable North end of Sayulita and includes six lovely homes on tropical grounds overlooking the beach. It is an easy, no hills, ten minute walk to the center of Sayulita. Unique restaurants highlighting fresh fish, local produce, international, and traditional foods are also located just outside the Las Gemelas gates. Playa Los Amigos in Sayulita features rolling lawns under coco palms and a salt-water pool overlooking the Pacific Ocean. The sandy beach and beautiful Pacific ocean are moments from your front porch. 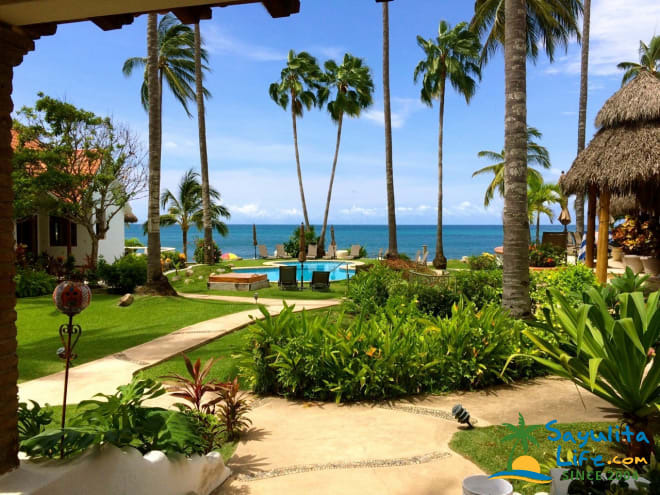 The great North End location is peaceful yet close to the surf break and the fun town of Sayulita to allow for a great vacation. The open layout is ideal for entertaining and vacation ease. Be prepared to relax as the house is furnished with comfortable furniture in traditional Mexican style. Bookcases are stocked with vacation reading, walls are decorated with beautiful artwork from around the region, and the covered porch makes a great shady spot for watching the day go by. The house has two bathrooms and two King suites, if you have a couple of extra guests, thecouches can be made into twin beds. Take your meals on the front veranda, dine indoors, or grab a quick bite at the breakfast bar adjoining the fully equipped kitchen. You can also barbeque in the private garden complete with a soothing fountain and lush plantings. Daily maid service, beach toys, sun umbrella, beach chairs, boogie boards and kayaks are included. We have stayed at the playa Los Amigos house for 2 years in a row. We have fallen in love with this little peice of paradise. The house was perfect for my family of 4. We have 2 young children so to be able to hop from the pool to the beach and back to the house with such ease was perfect for us. The house was very clean and well equipped with everything you need. We would sit on the front porch at night and listen to the sound of the waves and watch the sunset go down all from the comfort of house. I can't expess how much we love this gem of a place in Sayulita. We are hoping to make this our annual spot and continue to make more amazing memories at the Playa los Amigos house. We loved this wonderful modern house; with well equipped kitchen and spacious gathering space. It became the center of our family reunion. Lovely big outdoor area too. Very highly recommended!!!! We are so glad you enjoyed your time in Sayulita! Playa Los Amigos is one of six beautiful homes arranged around a beautiful landscape and pool, in a secure fenced compound open to the beach and the sea. It is within a close and comfortable walking distance from the town center. Home rentals are always a mystery until you arrive; this rental property does not disappoint, is in an amazing locale, is simply but equipped and very comfortable. I found peace of mind to be abundant here, making the journey to Sayulita well worth the effort. We highly recommend the Las Gemelas complex, and Playa Los Amigos. We had a large family reunion and this house was a great central location for our meals and gatherings. We loved the daily cleanings, and it was an amazing spot. We loved our stay at Playa Los Amigos. The villa is very comfortable, spacious and well equipped. I cannot fault this villa. This is our second time staying in the Las Gemelas complex and we felt very safe and very much at home. On arrival we were disheartened to find the pool empty and under repair. Once we emailed Courtney she was so apologetic and obliging, she arranged for the next doors pool to be at our use. (Thanks Janet!) In the meantime the previous villa we stayed at (Casa Viviana in the same complex) offered us the use of their plunge pool as well as they were renovating and the villa was vacant. What great friendliness and service! This complex is family owned and located in a fantastic position. Just north of town, but only a very small walk to the centre. Perfect location, perfect villa. I am so glad you enjoyed your time despite the pool mishap. So Glad everything worked out. As a family of four we had a great time in this beatiful house: very close to the beach, with great veranda to sit on at the start and end of the day, good beds, well-equipped kitschen and great showerroom. We will be back! Los Amigos was an ideal spot for our family -grandparents, parents & two small children. Lovely ocean view and pool. Small community of homes. Ample spaces inside and out. Large kitchen. Air-conditioned bedrooms. Outstanding housekeeper who was friendly, patient with us and thorough. We'll return. This house, and setting, are so very special! House is spacious and beautiful and quiet. The grounds are lush and private. And the pool (with a shallow end for little people!) was awesome. I hope to return and highly recommend it!! Restful, beautiful, well situated made the trip worthwhile! We loved Playa Los Amigos! I have decided to stay there every time I come to Sayulita. The home is artistically appointed, extremely comfortable and safe. The owners have furnished the house with beautiful Mexican treasures. You can sit on the porch and feel the ocean breezes. It is in a small compound, but feels very natural and privacy is assured. They have a security staff present which is great. The pool is clean and the beach is a very short walk from the front door. Excellent location, great living space! We thoroughly enjoyed the excellent access to beach and pool. It’s also a short walk to town and all restaurants which is great as it’s less noisy at night being away from town square. The housekeeper was fantastic and the place was in great condition with everything we needed to enjoy our stay. The nightly rate is $285/night with a 3-night minimum, flexible days. Christmas & New Year - $3800. These are Saturday to Saturday rentals. Joe and Susan have been visiting the paradise town of Sayulita for 10 years. In 2014 they decided to buy a home. They love spending time at their amazing home, but don't get to be there as much as they'd like. Therefore, they rent to lucky people around the world. We hope you can be our guests!